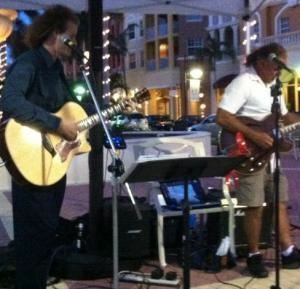 Pyrate Voodoo is Naples area's hottest new musical act. Available as a duo or a full band, We feature a variety of music from Rock to Southern Rock to Country, Folk, Modern Rock and Blues. Dance away to our sounds at your next venue! We will come and perform at your event for three hours. Breaks are 12-15 minutes per hour. We will come as a duo act. Extra hours are $100. Please check availability. Our schedule remains booked and it's important to book early. We will enjoy playing at your event! We will come and set up and play three hours as a three, four or up to seven-piece band (Two guitars, bass and drums, can also have keyboards, saxophone, percussion or flute or harmonica or 2nd sax, additional female singer). We will play for three hours and break once for 25-30 minutes. Price given is for the full 7-piece band, including an additional instrument or female vocalist. We will enjoy playing your event as long as we are available. Please contact us to check availability!